We all know how little girls love dressing up and being like their mum. Now they can take their appearance to a new level with Charmazing sets by Wooky Toys. Described as a bit like a ‘kids version of Pandora’, the various kits provide the stuff for girls to make all sorts of exciting pieces of charm jewellery. 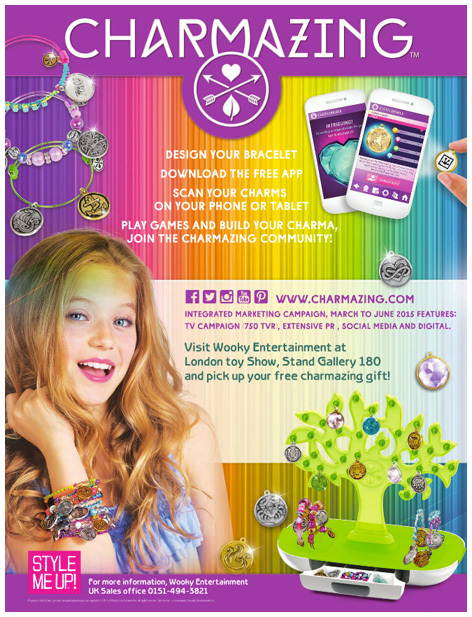 The larger Charmazing boxes contain a sturdy base that girls can use to make their bracelets as well as sections to store the various charm and trinket pieces before assembly. Each charm has a different meaning such as health, happiness, love or luck. Others are subtly coloured to add an extra fashion design to the finished pieces. Collect the energy cards supplied in each set and use any smart phone app to scan the charms and play the games. With dozens of themed sets to choose from and a similar number of add on packs, every little girl can create her own unique designs. Charmazing pieces can also be swapped for extra fun!